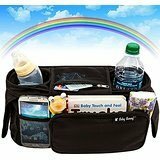 You’ll love this sturdy organizer with lots of zippered pockets and dividers to hold everything you need when you take a stroll with baby. Sturdy straps with swivel hook ends make it easy to attach the organizer to most any stroller. Slip pockets on each end provide easy access to cell phones and other devices. Expanding dividers on the inside organize diapers, wipes, extra clothes, bottles and more.